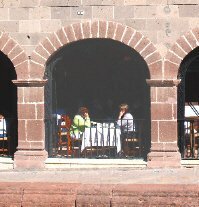 T he schedule of May events in San Miguel de Allende slows down considerably. By now, many of the winter visitors have flown back north and the temperature rises. May is usually the hottest month in San Miguel. The air hangs heavy, waiting for the summer rains to cool things off and settle the dust. Some restaurants and other businesses close for the month and take a vacation or work on renovations. It's a good time to let yourself slow down, too. Hang out at the hot springs. Enjoy the garden. Have long comidas with friends at a street-side table. If you're feeling really ambitious, practice your Spanish with someone. Or not. As my friend Sam once said (in a slow Texas drawl), "Sometimes in San Miguel is takes all day to do nuthin'." But San Miguel never goes to sleep entirely, and there's always something going on. Even a long, lazy May day is a good reason for a party. Besides these regular May events in San Miguel de Allende, there is also the usual assortment of lunches and lectures, films and art exhibits. Look for them on our Current Activities pages (coming soon). May 1 - Labor Day (Legal Holiday). Look for parades of workers and union members through El Centro and around the Jardín. May 3 - Día de Santa Cruz. In Catholic tradition, the date commemorates the time when Santa Elena, mother of Constantine, the first Holy roman Emperor, made a pilgrimage to the Holy Land to find the original Holy Cross ("Santa Cruz"). In pre-Hispanic tradition, the date relates to the return of the rains and the Cross of Tlaloc, its four points representing the four cardinal points, four seasons of the year, cycles of life and death, masculine and feminine. The Day of the Holy Cross is a special holiday for workers in the construction trades. If you're building a house, don't count on any progress today. The workers will likely show up bearing a cross—fresh from a priestly blessing—and put it up on your job site. And then your job is to put on a party for them. Bring in a supply of tamales and beer and watch them have a good time. May 5 - In the U.S., many people mistakenly think of Cinco de Mayo as Mexico's Independence Day. In fact, it's a relatively minor holiday here. The day commemorates the Battle of Puebla in 1862, when a small cadre of Mexican soldiers routed a French battallion. Businesses will be open as usual, but there will, of course, be fireworks and dancing. If you want a party, go up to Calle Cinco de Mayo in Colonia Allende for a great block party with music, street food, children's games and dancing in the street—a purely Mexican celebration. May 6 - Ascension Day. This religious holiday marks the 40th day after the Resurrection of Christ on Easter Sunday. Special masses and celebrations in most all the churches. May 10 - Birthday of Padre Miguel Hidalgo y Costillo. Father Hidalgo is considered the "Father of the Country" and the leading Hero of Independence. Look for celebrations in nearby Dolores Hidalgo, where he lived, was the priest in the local church, and where he gave the famous "Grito," the Mexican cry of independence in 1811. May 10 - Mothers' Day. This is a fixed-date holiday in Mexico, unlike Mothers' Day in the U.S. The holiday really starts the night before, when serenaders roam the streets throughout the night stopping to sing outside the windows of countless mamás. As with Valentine's Day, reserve early if you plan to eat out today. 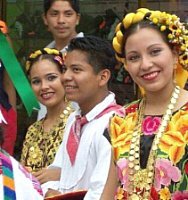 Late May - Festival of Valle del Maiz. This neighborhood just below the Mirador on the road to Querétaro has strong Chichimeca and Otomí roots and boy, do they know how to put on a party. The festival honors the Holy Cross (Santa Cruz), goes on for about three days, and is hard to describe. It's the most fun of all May events in San Miguel de Allende. Imagine solemn rituals, oxen wearing necklaces of limes, young guys trying to climb a greased pole, mock "Indians-vs.-Spaniards" battles, medicine men, conchero dancers, mojigangas (larger than life-size puppets), rockets, music, piles of food and three days of almost non-stop fireworks, and you begin to get a feeling for the thing. Just go. May 26 Festival of San Felipe Neri. The feast day of the so-called "Saint of Joy," so-called because Father Neri reportedly loved to laugh, to sing, to tell jokes. There will be music and dancing and, of course, fireworks (look for a castillo,at the Oratorio Church at the Plaza Cívica. For details about one-time May events in San Miguel de Allende, visit Atención online.